She has the magic ability to soothe and bring peace to the individuals with autism, Down syndrome, physical disabilities, ADHD, anxiety, and so on. And for this, she uses music therapy, a very scientific and holistic treatment that improves communication, physical skills, academic/cognitive abilities, self-regulation and expression, social and emotional functioning, and so on. 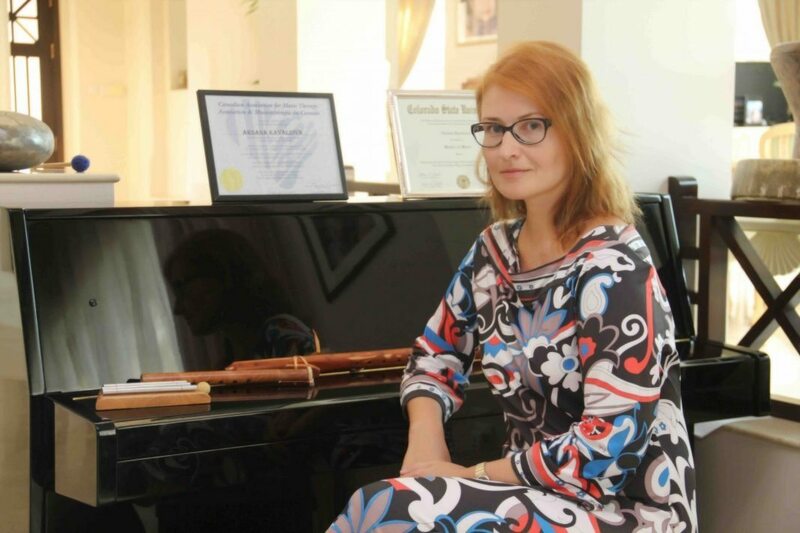 BTW speaks to Aksana Kavaliova, Accredited Music Therapist, Neurologic Music Therapist to understand this wonderful work that she goes about carrying out. I was born in Belarus, then USSR, and raised in a family of musicians. My Mom was a piano teacher, Dad was a head of cultural centers and a good singer, and my brother became a composer and a sound producer. I began singing at 18 months, and both my brother and I had our first stage experiences at 3 ½ years. In the 1980s-1990s we as a family ensemble sang in many concerts, won several provincial and national prizes, appeared in TV shows. So, basically, music always played a huge role in our lives. Tell us briefly about your educational qualifications and professional background. In Belarus I finished Vitebsk State Music College as a teacher of theory and history of music. Then I pursued my BA in Cultural Studies from Belarusian University of Culture and Arts in Minsk. While studying, I worked at a school, and as an artist in the national organization “Belconcert”. When and how did you decide to take up music therapy as a career? I first heard about music therapy from my step-daughter who lived in Canada, in 2002. I always knew there was more to music than just lessons and entertainment. When I immigrated in 2004, I got accepted at the University of Windsor, Ontario, in their Bachelor of Music Therapy with internship program. After graduating, I came back to Bahrain to join my husband, and began my private practice first at the Children’s Academy, then slowly added private clients/students to my caseload. In 2014, I graduated with Master’s in Music Therapy degree from the Colorado State University. I also completed Neurologic Music Therapy course and NICU-Neonatal Intensive Care Unit music therapy tier 1 course. Tell us in brief about the various kinds of diseases/disorders which can be cured by music therapy. It is incorrect to say that any therapy can “cure” a disease. Music therapists work with a variety of populations: Neonatal /Postnatal (moms and babies); helping hospital patients to lessen pain, improve mood, facilitate pre- and postoperative symptoms. We work in physical rehabilitation alongside with physical and occupational therapists. Music therapists help patients with stroke and brain injuries to acquire speech and language, to improve motor and cognitive abilities. A lot of us work in oncology wards. Music therapy is widely used with children and adults with intellectual and physical disabilities, with developmental delays, Down syndrome, Autism Spectrum, ADHD, and other disorders. Among other examples is trauma, anxiety, PTSD, mental illnesses, Dementia/Alzheimer’s, Parkinson’s disease. And, of course, elderly people, in nursing homes, palliative care and hospice units. What age-groups approach you mostly for music therapy? As you can see, music therapists work with all ages, from pre-birth through the lifespan till the last breath. While in Canada, I practiced in a hospital, nursing homes and hospices, with children, expectant mothers, and oncology patients. For the past 8 years in Bahrain, I have been working with children and adolescents with various disabilities and disorders (e.g., Autism, Down’ syndrome, physical disabilities, ADHD, anxiety). What have been the various challenges that you have encountered since the inception of your own consultancy? How did you overcome the challenges? The biggest challenge was to spread awareness about music therapy. Some people are skeptical, or see it as an “activity” that can be skipped, or changed to something else. If we want to see results, we need to work continuously in sessions. For some, a month or two can be enough, for others, more long-term involvement is required. I built excellent professional relationships with some therapists here, and we refer individuals we work with to the appropriate specialists. As to public awareness, I gave numerous workshops and presentations locally, for professionals and parents. The situation is much better now than some 5-7 years ago, I am happy about it. Music is a powerful tool, because it engages our entire brain, shares networks with speech/language, sensorimotor, cognitive regions. By bypassing regions affected by a disease or injury, music improves existing and builds new neuronal connections. Music therapists use music and elements of music to address individual goals. Depending on populations, those can be communication, physical skills, academic/cognitive abilities, self-regulation and expression, social and emotional functioning, activities of daily living, pain management, improving quality of life of individuals and families, to name a few. In sessions we may play instruments, sing, move to music, listen, improvise, and compose. In which kinds of institutions can music therapy be most effectively used? Music therapists successfully work in a variety of institutions, such as schools, hospitals, rehabilitation centers, psychiatric units, elderly care. How far back in history can music therapy be traced back to? Music was used therapeutically throughout human history. In the Middle East, music was present in hospitals and asylums in the 10-13th centuries! First music therapy writings are dated back to the 19th century. Professional music therapy began after the WWI and WWII, in North America and Europe. First university training was established in 1944, at the Michigan State University, and the first professional association in USA in 1950. Canada, Europe and Australia followed in 1960-1970s, and now we have more than 300 university programs across the globe, which offer Bachelor’s, Master’s and PhD trainings. Anyone who needs to work on those goals and skills I mentioned before will benefit from music therapy, children and adults alike. What is your message to those people who are hesitant to try out music therapy? They can find more information about this evidence-based form of therapy by visiting my website www.aksanamusictherapy.webs.com where I have links to various online resources. I will also be glad to answer your questions. Next articleSoul Sating Seafood Night Every Thursday!